Rhaphidophora foraminifera, copyright Eric in SF. 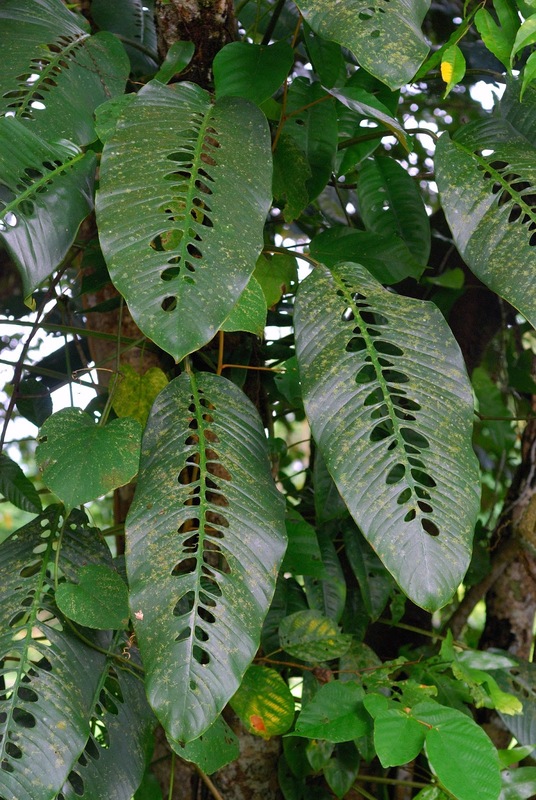 Rhaphidophora is a diverse genus of climbing aroid plants found in the Old World tropics. See also: Taxon of the Week: Rhaphidophora. Characters (from Flora of China): Lianas, large; raphides numerous on stem and leaf; laticiferous ducts absent. Stems thick, creeping and climbing up trees or over rocks by aid of adhesive roots. Leaves distichous, petiolate; pulvinus short or long; petiole often adaxially grooved or canaliculate, sheath extending to pulvinus; leaf blade entire or divided, or perforate, thinly to rather thickly leathery, pinnately veined. Inflorescences terminal on leafy shoots, solitary or sometimes in a fascicle (synflorescence); as synflorescence develops axis sometimes reiterating and overtopping synflorescence such that inflorescence cluster is displaced and appears to be produced laterally (here termed "appearing axillary"). Spathe not constricted, initially inrolled and tubular, afterward spreading, firm, mostly early caducous, rarely marcescent. Stalk of spadix short or absent; spadix cylindric. Flowers many, bisexual or sometimes a few male, naked. Stamens 4; anthers much shorter than filaments, dehiscent by a slit. Ovary 1- or incompletely 2-loculed, 2- to many ovuled; ovules basal or parietal, 1- or 2-seriate; style broadly conic; stigma circular to linear, in latter case longitudinally inserted. Fruit with stylar plate sloughing away in groups or singularly to reveal ovary cavity with seeds embedded in pulp, many seeded. Seeds small, oblong to reniform. [TB04] Tam, S.-M., P. C. Boyce, T. M. Upson, D. Barabé, A. Bruneau, F. Forest & J. S. Parker. 2004. Intergeneric and infrafamilial phylogeny of subfamily Monsteroideae (Araceae) revealed by chloroplast trnL-F sequences. American Journal of Botany 91 (3): 490–498.